The first thing to ask is “What is 4k video”? 4k Video (H265) is a short name for ultra high def video. It is twice the resolution of H264 or known as HEVC. It is early days with this technology but its being adopted by companies like Amazon and Netflix. With 4k comes very high quality but also even with compression encoding, still makes a large video file. This can be problematic with streaming so you need very high powered servers and network pipe. 4k video can also be used to stream video to your ROKU Channels. 4k TVs are now being shipped but there is not much in the way of content (yet) and that’s where you come in. Can I stream 4K video? Yes. 4k is contained in the mp4 format and is supported by FLV Hosting players and streaming service. 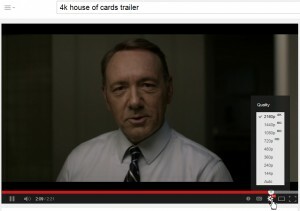 Netflix just filmed Season 2 of its original show “House of Cards” in 4K. After that, Netflix will film other originals in 4K as well. The company also has said that it will have 4K streaming to support its original content — first on specific smart TVs, such as those from LG, Samsung, Sony and Vizio. Though they haven’t mentioned Netflix deals, both Panasonic and Toshiba have announced their new 4K TVs will support the HEVC codec that Netflix will use to make streaming 4K possible. So, soon you will be able to watch Kevin Spacey lie and scheme in 4K via Netflix streaming, as long as you have the right 4K television and 15+ Mbps bandwidth. While 4K video availability remains relatively limited, even you may be an important 4K content provider in 2014. Several Android phones coming down the pipeline will be able to take videos in 4K, though phones with actual 4K screens have yet to be revealed. The Acer Liquid S2, for example, can shoot 4K video, though it isn’t available in the United States. Likewise, the Samsung Galaxy Note 3 can shoot 4K video, but the feature was disabled for the models sold in the U.S. However, both the new LG G Pro 2 and Sony Xperia Z2 can shoot 4K video. Either way, with Android 4.3 and up supporting 4K video, phones with 4K capabilities will be arriving on U.S. shores soon. How do i compress 4k video for streaming ? There is one other way to watch 4K content now: on your computer.